The new Adobe tool Rush is now available for mobile editing -- it was announced in summer as Project Rush and can now be used as Premiere Rush CC both individually and within the Creative Cloud family. According to the manufacturer, this can be done without any previous knowledge and is platform independent, mobile and on the desktop, at least in principle; the Android version will be delayed for the time being. Rush is primarily intended for mobile video production. 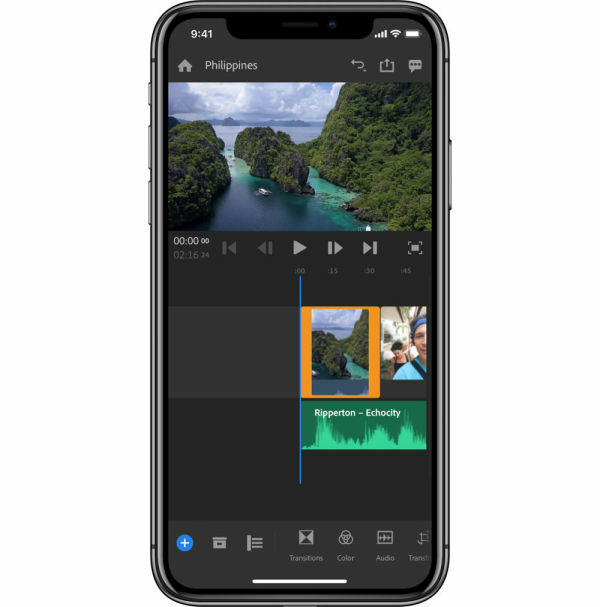 All necessary processing steps are to be covered, starting with the recording -- an in-app camera is included -- through the editing including a simplified color and audio correction to the export to portals such as YouTube & co. Thanks to access to Motion Graphics templates in Adobe Stock, the videos can be visually spiced up during titling, among other things. In the audio area, Adobe's AI algorithms (Sensei) support the user with, among other things, an auto-duck function that can be used to adjust music and normalize sound. Since the video projects are stored in the Adobe Cloud, the different work steps can also be carried out on different devices. If you want, you can also open and edit your Premiere Rush project in normal Premiere Pro; if you subscribe to Premiere Pro CC individually, you can now also use Rush. The Adobe Premiere Rush CC subscription is offered individually for 11.89 euros per month, including 100 GB cloud storage space (up to 10 TB can also be booked). There is also a free trial version (Starter subscription), which allows a maximum of three exports and offers 2 GB cloud storage space.